The Finnish capital of Helsinki held mass protests on Saturday both in support and against refugees arriving in the country, local media reported. MOSCOW (Sputnik) — The pro-refugee demonstration, bringing together over 500 people was held in the center of the city. The anti-refugee rally, counting up to 200 people, grew violent with some 20 people arrested. The anti-refugee demonstrators took to the streets to protest migrant violence towards women, while their opponents claimed that new refugee arrivals in no way threaten peace and security in the country. 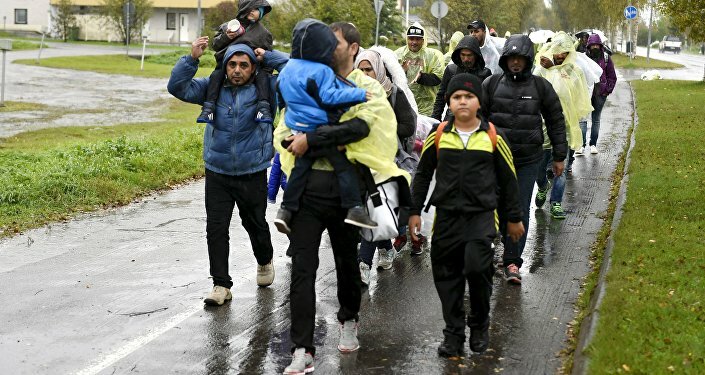 Earlier this week, the Finnish Interior Ministry announced the country may reject some 60 percent of refugees who sought asylum in the country in 2015, which would amount to almost 20,000 people. Last year, the county received 32,000 asylum applications, while in 2014 only 2,600 migrants arrived in Finland. EDITOR'S NOTE: An earlier version of this article was incorrectly illustrated with a photo of Finnish hockey fans celebrating in Helskinki in January.